Experience vast penguin rookeries and seal colonies on this awe-inspiring voyage to Antarctica, South Georgia, and the Falkland Islands. This 21-day voyage illuminates Ernest Shackleton’s legend and recounts his courageous exploration of Antarctica. You’ll visit historical sites of past explorers, as well as Shackleton’s final resting place – the wildlife-rich island of South Georgia. Antarctica is beyond comprehension and sure to amaze any traveller seeking a true adventure to the world’s most remote wilderness. Arrive in Ushuaia at any time. Arrival transfer included. Enjoy the sights and sounds of the world’s most southerly city. Enjoy a free morning in Ushuaia. Do any last minute shopping, explore the town, or visit the surrounding countryside. Embarkation on the G Expedition begins in the afternoon at the port in Ushuaia. Enjoy the evening sailing through the Beagle Channel. As the G Expedition makes passage east, become acquainted with the ship. Begin lectures and information sessions about the extraordinary human and natural history of the Antarctic region. On the passage east visit the common areas that include the lounge, dining hall, library and lecture hall and meet the guides, ship’s crew and lecturers. Begin the lectures and information sessions to learn the extraordinary human and natural history of the Antarctic region. The Falkland Islands provide a rare opportunity to witness the biological diversity and extraordinary scenery of the southern islands. Penguins are abundant here, and the Falklands have the largest black-browed albatross colony in the world. In Stanley, meet the hardy local inhabitants whose colourful houses provide contrast to the long, dark winters. Catch our first glimpses of penguins, including the Magellanic, rockhopper, gentoo, and king penguins. With a little luck, spot elephant seals, sea lions, king cormorants, black-browed albatross, skuas, night herons, giant petrels, striated caracaras and of course sheep. Sailing east, set course for South Georgia. Days at sea are filled with lectures to prepare for landings. Watch for the many whales that inhabit these waters. Home to many interesting sights (including the grave of polar explorer Ernest Shackleton), South Georgia has several former whaling stations and boasts plenty of wildlife. Visiting a huge colony of king penguins is a major highlight of this part of the journey. Weather permitting, spend three full days exploring the island. Weather permitting, three full days will be spent exploring this island. On nearby islands look out for the wandering albatross in their nesting grounds. 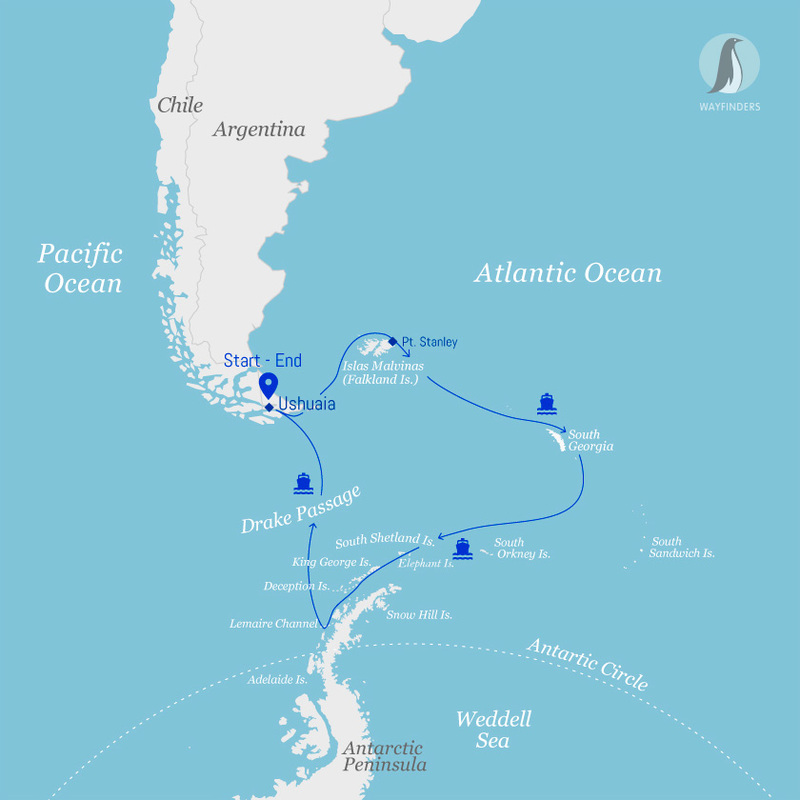 Sail for two days, retracing Shackleton’s route backwards on course towards Elephant Island and the Antarctic Peninsula. These waters are rich with nutrients and the long summer days provide the ingredient that is missing most of the year. The result is a complex food chain topped by several species of whales, seals, and seabirds. Experience some of the most unique wildlife and awe-inspiring scenery in the world while setting foot on the Antarctic continent. Attempt two shore landings per day (weather permitting), and encounter Gentoo, Chinstrap, and Adélie penguin rookeries; Weddell, crabeater, and leopard seals; and orca, humpback, and minke whales in the cold Antarctic waters. The peninsula also has a remarkable human history. Finally a chance to step foot on the Great White Continent! Over the next four days, the Expedition will navigate southwards making stops in the South Shetland Islands then through the Bransfield Strait and to the Antarctic Peninsula. Our goal is to attempt two excursions per day while we navigate through the area but our itinerary and daily schedule will be based on the local weather and ice conditions that we encounter. The Antarctic Peninsula and the South Shetland Islands abound with wildlife activity. Take a chance to visit scientists working in modern research bases, with plenty of time to enjoy the sheer beauty and the breathtaking scenery of ice-choked waterways, blue and white icebergs, impressive glaciers and rugged snow-capped mountains. 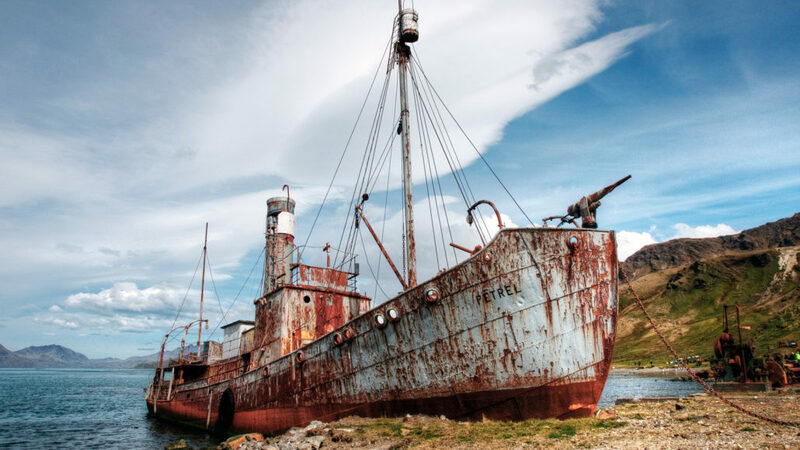 The Peninsula also has a remarkable history and, during the voyage, opt to learn about some of the most important and dramatic expeditions to this remote corner of the world. Reflect on a memorable adventure and take in some final lectures en route back to Ushuaia. Keep a careful lookout for a last chance to spot whales. Heading north across the Drake Passage, spend two days enjoying the beauty of the sea while sailing for Ushuaia. In between bird watching, whale watching, and enjoying some final lectures by our expedition staff, this is a chance to relax and review the adventures of the past week before returning to Ushuaia. Remember, the best way to experience the wildlife of the Drake Passage is to be on deck keeping a look out for Albatross, Prions, and Whales! Disembark in the morning. Our adventure comes to a close. Have a final breakfast on the ship before saying goodbyes before disembarking in Ushuaia in the morning.